If you like to chat and make new friends online, then you are most likely to be aware from Omegle. Yeah, the same site on which you can start text or video chat with strangers in no time. Well, if you are chatting addict, then there is no need to introduce you with 'Omegle', 'how to use it' etc. You all know better than me. Well, there are many websites that let you do text and video chat with strangers. You might have list of alternatives to Omegle, but there is one feature that is there only in Omegle. The feature that I am talking about is 'Spy Mode'. This Spy Mode is also known as Question Mode, and is yet another good way to have fun on Omegle, apart from text and video chatting. Omegle Spy Mode is about asking any question that is in your mind, and then getting it discussed in two strangers. Means, in this mode, you ask any question of your desire, and then watch two strangers discussing it. Using Omegle Spy Mode is quite simple. All you need to do is to click on ' or try spy (question) mode...' . After clicking on it, just enter the question that you want to ask. 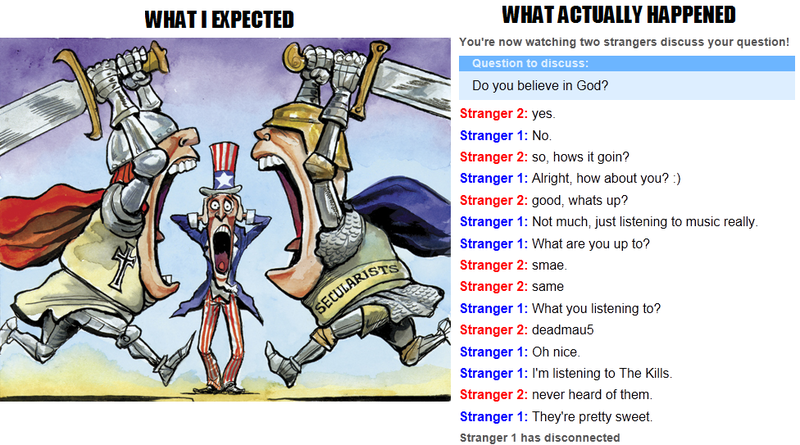 Omegle will take you to the discussion page, where it will search for two strangers. Those two strangers will answer your question, and in no time, an interesting discussion will start. You can disconnect the discussion at anytime you want to. Quite interesting and unique feature, isn't it? Try omegle spy mode straightaway!